1. There are 11 teams that are currently 3-3 & 12 teams with losing records. That means there are only 9 teams with an above .500 record. 2. Through Week 7 of last season there were 15 teams above .500, four 3-3 teams, and 13 with losing records. 3. Everyone knew it was only a matter of time before Aaron Rodgers & Co. unloaded on someone. Not everyone imagined it would be Week 6 and against the stout Houston Texans. 4. The Green Bay Packers are the team with the biggest jump this week, climbing from #18 to #11 based off their impressive dismantling of last weeks #1 team. 5. The New York Giants just plain put a beat down on the 49ers in every sense of the word. DT Chris Canty being activated from the PUP list could be huge for the Giants D.
6. 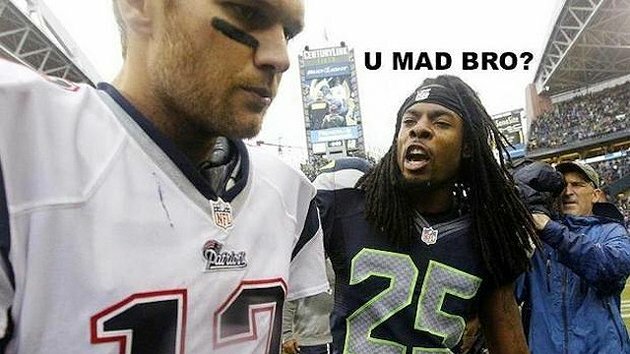 Richard Sherman and the Seahawks didn’t take kindly to Patriots pretty boy QB Tom Brady trash talking them on the field. Sherman’s response here. 7. Baltimore escaped with a thin decision over Dallas, 31-29. Good win at home, but they have now lost LB (and future HOFer) Ray Lewis for the rest of the season due to a completely torn triceps. Did he play his last game…ever? They also lost CB Lardarius Webb, with a torn left ACL, for the season. 8. The Falcons are not the best team in the league. They are however the only undefeated team at 6-0 and so they are #1 in my rankings. Doesn’t hurt that the Texans and 49ers fell on their face either. 9. Seven of the top 10 teams reside in the NFC. Eight of the bottom 10 teams reside in the AFC. Take that for what it’s worth. 10. Turns out I had ten points again. Boom.